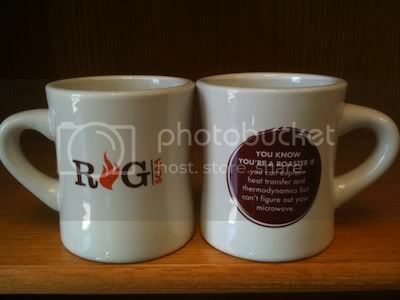 Roasters Guild Forum • Roasters Guild Mug - Clever captions requested! We're looking to reproduce the Roasters Guild mug with an assortment of sayings, and we need your help! We have a couple that we are considering, listed below, but we'd love to hear what you come up with. If your clever caption is chosen, we will send you a free mug with the new saying! Start your saying with "YOU KNOW YOU'RE A ROASTER IF..."
- YOU KNOW YOU'RE A ROASTER IF you can explain heat transfer and thermodynamics but can't figure out your microwave. Please submit your suggestions by Wednesday, November 23, 2011. ...you've eaten 1/2 a cup of coffee beans from the cooling tray in the course of a day. ...you grew a mustache to cover up a gnarly trier burn. ..."first crack" becomes the most frequent term in your daily lexicon. ...you swish, spit and discuss every liquid you taste. period. ...you don't need to know all of the notes. You wrote them. ...you've tried to barter coffee for things like used cars or bikes on craigslist. ... you've tried to apply roasting fundamentals to stir fry. "You know you're a roaster if...you accept that trier is a real word." ...you are un-beatable at "Hot Potato". ...you have pipe-scraping scars on every knuckle. ...you can smell a chaff fire from a mile away. ...you've spent the night on pallet of beans. ...you've told the firemen "this is not the fire you're looking for". "this is not the fire you are looking for" gets my vote, twice. You know you are a roaster when everyplace you go, folks ask “is someone making coffee”? You know you are a roaster when your coffee kit is the largest piece of luggage for a 3 day weekend. You know you are a roaster when you unplug the vending machine @ a rest stop to brew from your coffee kit. You know you are a roaster when you use old green coffee as kindling to start your campfire. You know you are a roaster when more than half your kitchen counter space is consumed by the espresso machine. You know you are a roaster when your hunkering down for a storm, the first concern if power and water go out is that you have all your supplies to make coffee.